Imagine if you could search all your files in the cloud as fast as they were on your local computer. 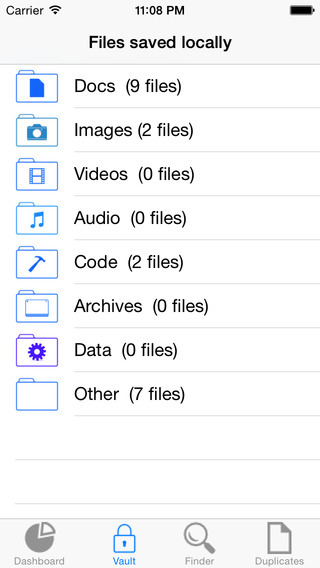 Imagine if you could quickly identify duplicate files across all your cloud services from your iPhone. Imagine if you could have a visual overview of all your files in the cloud: not just dry numbers, but interactive charts! 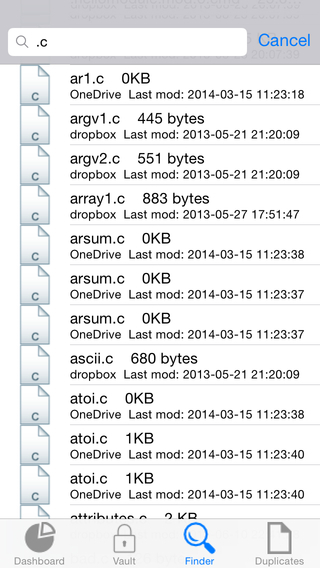 This is now possible with CloudFella: manage all your files in the cloud...like a Boss ! Built from the ground up to take advantage of the booming cloud storage trend, CloudFella will dramatically speed up and simplify accessing Cloud storage services. CloudFella will provide visual analytics about your footprint in the cloud and allow you to browse remote directories as fast as they were local. A powerful search feature will find the files you need almost instantly: find duplicate files across all your cloud services fast ! 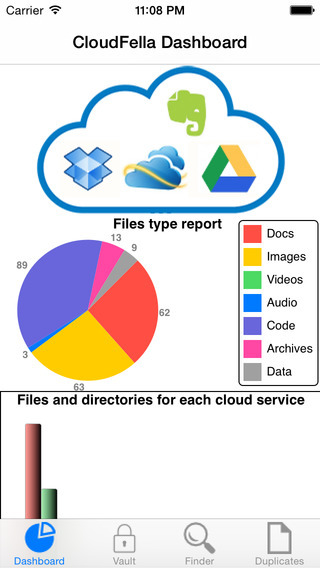 Spread your files across multiple cloud services and access them via CloudFella's beautiful and interactive charts. Share your photos with your social networks and attach documents to e-mails: with Cloudfella all your files in the cloud are at your fingertips ! CloudFella is the first productivity tool to get the Cloud right: try it !